At every level, leaders are called upon to lead – the opportunities to lead are abundant. However, leadership, compelling as it is for many and at times a near addiction, comes with incredible challenges. Leadership challenges make ‘leading-effectively’ difficult, but not impossible. BB and SMART organizational status is attained when leaders include more than the leadership OV in their organizational development (OD) toolbox. In effect, leaders are forced to take the leadership blinkers off and look further afield. Effective leaders see more than leadership on their OD. horizon. A leader that does not embrace the help of other OV’s is likely to preside over decline or death at the organization they lead. As discussed on the blog last week, a BB and SMART organization is systemic by nature. Strategy at the bionically balanced entity is akin to the determination and manufacture of a particular vehicle model – a vehicle has many parts, some moving and others static. Yet, all the vehicle parts have been assembled in the context of a system to deliver a certain: amount of horsepower, comfort, and to meet the demand for a particular vehicle niche like: ‘4×4′ off road, town runner, or heavy goods carrier. Each part of a vehicle’s system has a role it plays for the particular vehicle to meet its niche-standard. Design (architecture) is the glue that cements together the organization’s vision as defined by the owner, the strategic intent, and the human-resources that put in the hours to realize the vision and strategic intent. Without effective design – the strategy and leadership OV’s above, however well crafted, cannot succeed in creating value and wealth for the organization. Like the example of the loving family without a roof over their heads, the family members will end up scattered on the streets as they scamper for warm places to spend the night. At the Effectiveness lab, we believe that the most valuable asset for any organization (including the family) is its people (staff/members). Organizations that get the best out of their teams lead their peers in the race for productivity and effectiveness. We have elaborated above how none of the four OV’s on their own, can deliver you BB at the organization. BB only accrues when OV’s are intertwined. Leadership requires good strategy, good strategy requires good OD. design, and good OD. design requires people with the right skills and competencies. The chain is only as strong as its weakest link. Recognizing early signs of organizational bionic-imbalance (BI) is hard. Like an orchestra bandmaster, having to: feel, touch, see, as well as sense signs of BI, is amongst the ‘hardest’ leadership skills and a source of failure for many. [Uber the company that has cleverly used an App to disrupt the urban taxi industry has since its launch enjoyed incredible industry power, growth, and a cowboy leadership culture. Uber promises to get you in a car in less than five minutes, and it has been true to its promise on many occasions, even in chaotic Nairobi. However, bionic-imbalance comes at a substantial cost even to industry giants like Uber. Uber’s top leadership has recently found itself in trouble. Staff have accused Uber of encouraging a culture of sexual harassment at the firm; the firm has been accused of running a recruitment machine for its HR function as opposed to a proper and sustainable people and culture approach; and it’s founder and leader has recently been exposed to the world behaving in a manner that is un-leaderly. Even in Nairobi, which must be one of Uber’s smaller markets, Uber is in trouble with its key stakeholders – drivers. While at the outset Uber’s troubles can be categorized as a leadership OV matter, and Uber’s CEO and board have moved swiftly to appoint a COO, the problem is more than that. The appointment of a COO may not address Uber’s woes unless Uber and its governors and management oversee the development of a more bionically-balanced company eco-system that integrates all the four organisational-vitals – i.e. 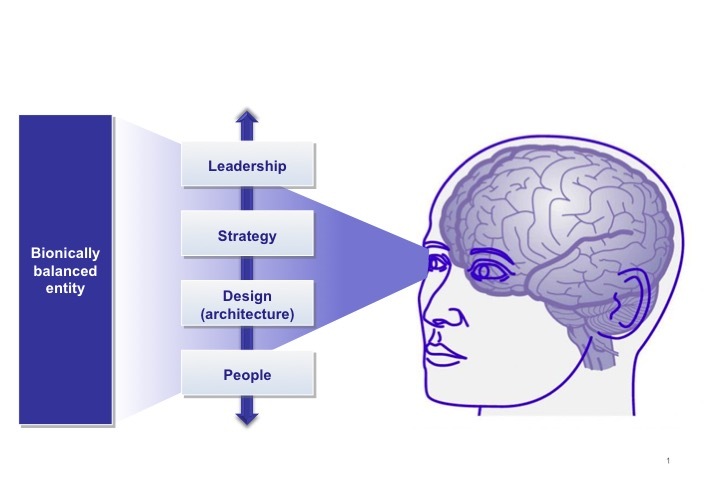 Leadership, Strategy, Architecture, and People.